Behold! This past week I had the pleasure to experience the East Coast Chamber Orchestra (ECCO) for the first time. This group has to be one of the most dynamic ensembles I’ve ever seen. Their performance at the Center for Performing Arts in Carmel, Indiana was truly thrilling. The program began with Arvo Pärt’s Fratres, a beautiful piece featuring Susie Park on violin. Ms. Park handled the technical hurdles (arpeggiando galore!) with aplomb, and the ensemble accompanied sensitively. Next was Tchaikovsky’s Serenade for Strings, a quintessential Romantic work and something of a war horse for chamber orchestra programming (the repertoire for this medium isn’t bountiful). ECCO provided an intense, fresh interpretation, and I think even the most jaded listener would’ve been very much engaged by their rendition. In this piece I noticed the astonishing unity of the group. The performers communicated so well that even though their individual playing styles were unique, the collective sound synthesized effectively. ...ECCO came to my school! Over the course of the day some fellow students and I got to observe ECCO in an open rehearsal, play in a side-by-side workshop, and perform for masterclasses with members of the ensemble. The open rehearsal was intense. ECCO was practicing movements from Bartok’s Divertimento for String Orchestra for their next performance. The rehearsal process was extremely detailed and focused, although the members kept a steady flow of humor (Nick Kendall was especially easy-going). The decision-making process seemed to be fairly democratic, with players voicing their opinions about phrasing, dynamic, direction, and articulation quite freely. Occasionally I detected slight rumblings of an imminent argument, but a consensus was usually reached before it came to blows (I kid, I kid). The side-by-side was inspirational and just a tad mortifying rolled into one. 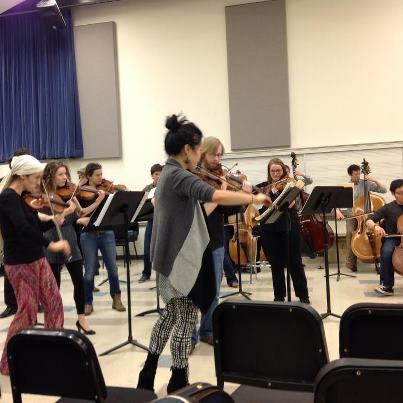 Butler University students joined ECCO in a performance of Serenade for Strings. It was awesome to be right next to world-class performers. I shared a stand with Michi Wiancko and was agog at both her technical facility and superior musicianship. My own bumbling performance was not especially endearing to those around me, alas. As we shifted stands (and even sections) to emphasize the importance of communication and listening across the orchestra, I had a few exhilarating minutes sharing a stand with Susie Park as concertmaster- I can put that on my resume, right? After this my quartet performed some of Borodin’s Quartet No. 2 in a master class where we received some pointers about phrasing, balance, and the importance of mapping out an interpretation. I observed a few other masterclasses, including one by Ayano Ninomiya, who shared valuable information about posture. This was a very special day for all of us students, I think. ECCO was generous with their time in working with us, and I found the combination of their performance and teaching to be very inspiring. If you ever have the chance I would highly recommend attending a performance by this group!